Hypervelocity stars zoom around the centre of the Milky Way, where a supermassive black hole lurks. Six speedy stars rocketing through space at up to 2 million miles per hour were likely ejected from the giant black hole at the Milky Way’s heart, astronomers say. They represent the first known “hypervelocity stars” with masses similar to that of our sun.The discovery, unveiled last month, could shed light on how stars form in the dust-shrouded core of our home galaxy. That’s because hypervelocity stars are thought to form when the supermassive black hole at the centre of a galaxy devours one star in a binary system and ejects its twin, flinging it through space at superfast speeds, said study author Keith Hawkins, an astronomy student at Ohio University. “These are incredibly fast-moving objects that are actually gravitationally unbound to the Milky Way,” he said during the 221st annual meeting of the American Astronomical Society in Long Beach, Calif., last month. Because speedy rogue stars have been ejected from the galactic centre, identifying them can reveal the types of star formation occurring there. But until now, astronomers searching for these hypervelocity stars looked for bright, blue stars in locations where they weren’t supposed to form. Those stars, while easier to find, are typically three to four times as massive as our own sun, while most stars forming in other regions of the galaxy are the size of our sun or smaller, Hawkins said. 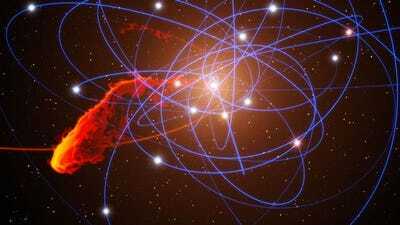 They found 130 stars on the edges of the Milky Way’s central black hole that had traveled a remarkable distance. They then narrowed that group to stars travelling at extreme speeds consistent with ejection from the Milky Way’s centre. Six stars met those criteria. But if verified, they could shed light on the types of stars that form in the galaxy’s heart, and help astronomers estimate the size of the black hole lurking there, Hansen said. Follow Space.com on Twitter @SPACEdotcom. We’re also on Facebook & Google+.